According to the USDA, the United States began enforcing the new standard for imports in June 2004. To prepare importers for enforcement, the USDA started issuing advisory administrative noncompliance notices to importers in April and May of 2004. The Department of Agriculture hoped such notices would give importers sufficient time to get in compliance with the new standards by the enforcement deadline. Compliance for outbound shipments is mandated by our many trading partners’ implementation dates. See Chart of International Implementation Dates. Wood Packing Materials Standard ISPM 15: The United States joined an international agreement on import requirements for Wood Packing Materials (WPM)—both hardwood and softwood—used in international trade. The objective of participating governments is to develop a uniform standard to control pests in wood packaging material used in global trade. The standard itself is nonbinding, thus participating countries are responsible for passing legislation implementing the requirements set forth in the standard. Because each country is moving at a different pace, it is difficult to provide U.S. exporters with a specific implementation date. According to the U.S. Department of Agriculture, the United States began enforcing the international standard for all imports in July 2004. Under the new international standard (ISPM 15), all wood packing material must be heat treated or fumigated following the standard’s conditions. After treatment, the materials must display the approved logo as trademarked for the International Standards Committee. The mark acts as proof that the materials have received correct standard treatment. No further certification is required to assure compliance. The standard applies to all unprocessed wood or wood products (excluding paper products) used in supporting, protecting or carrying a commodity. This includes pallets, dunnage, crating, packing blocks, drums, cases, load boards, pallet collars and skids. Please note that it applies to all wood packing material and is not limited to only softwood. Effective Date for Imports. According to the USDA, the United States began enforcing the new standard for imports in June 2004. To prepare importers for enforcement, the USDA started issuing advisory, administrative noncompliance notices to importers in April and May of 2004. The Department of Agriculture hoped such notices would give importers sufficient time to get in compliance with the new standards by the enforcement deadline. Effective Date for Exports. Compliance for outbound shipments is mandated by our many trading partners’ implementation dates. See Chart of International Implementation Dates. Q1:What is Wood Packing Material? Wood Packing Material (WPM), also known as solid wood packing material (SWPM) and nonmanufactured wood packing (NMWP), is defined as wood packing other than that comprised wholly of wood-based products such as plywood, particle board, oriented strand board, veneer, wood, wool etc., which has been created using glue, heat and pressure or a combination thereof. This includes pallets, crating, packing blocks, drums, cases, load board, pallet collars, skids, etc. No, the standards will require all dunnage, including skids or runners used to transport bundles of lumber, be heat treated. Q3:Can I apply the markings as shown, even if there is no agency oversight process established within my country right now? No. Each National Plant Protection Organization (NPPO) is responsible for program oversight, so the use of marks must be coordinated with the NPPO. Companies that use the marks improperly will be investigated, possibly prosecuted and likely fined. The U.S. organization dedicated to oversight is the USDA's Animal Plant Health Inspection Service (APHIS). Q4:How stable is the standard? What is the timetable for potential changes to it? The IPPC will be reviewed in three-year cycles and the necessary adjustments will be made accordingly. Q5:What liability do I have for the heat treatment process on my products? Does product liability insurance cover this process? This is best explained with a short example. A manufacturer produces, heat treats and affixes a quality mark or grade stamp upon the treated wood packaging material. The material is purchased and used for its intended purpose by another company. This company ships its product overseas whereupon the port authority denies delivery due to the fact the pallet was not properly heat treated and potentially contains a form of pest or bacteria. The shipping company then wants to initiate legal proceedings against the manufacturer of the pallet for its monetary loss. In the example, the general and products liability policy would not respond, as there was an absence of “bodily injury or property damage.” Furthermore, the policy excludes coverage for “Impaired Property.” Impaired property is defined as a product that has a defect, deficiency, inadequacy or contains a dangerous condition. The policy also excludes the recall of products, work or impaired property. Unfortunately, the above scenario is an uninsurable occurrence. The shipper could bring suit against the manufacturer and the insurance company would have the “right” to defend but not a “duty” to defend. There must be a physical loss to the shipper’s property for the General Liability policy to respond. However, if it was determined that pests infiltrated the product and caused damage, and that the proximate cause of the pests was attributed to improper heat treating, then the policy could respond to incurred damages. This could be difficult to litigate since a pallet changes hands constantly. But again, the recall expense of the pallet would still be excluded. The coverage does not pay for costs associated with redistribution or replacement of the withdrawn products with like products or the repair of the withdrawn product. The likelihood of a claim or suit arising out of properly treated wood is minimal. The Service Corporation recommends that you review your policy with your insurance professional and legal counsel. Q6:How many countries are members of the IPPC? The United Nations countries number is 134 countries. The IPPC is a convention of these members. The standards are designed to stop the spreading of exotic pest to outside countries. In the past, exotic pests have proven detrimental to primary U.S. indigenous species. One of the country’s dramatic infestations resulted from the introduction of the chestnut blight. It was brought over from China 100 years ago and quickly spread through the Appalachians. The foreign species was responsible for destroying native American chestnuts and eradicating the trees from major roundwood and nut makers. Another example includes the recent attempts in Chicago neighborhoods to control the Asian Longhorned Beetle, which was brought into U.S. warehouses via packing materials. Other large U.S. cities have also been negatively affected by several foreign pest infestations. The new standards will regulate the different practices in several countries into a single standard. It also prevents countries from using “unique standards” to control or limit trade internationally. Q8:What methods can be used to satisfy the standards? Acceptable treatment measures include heat treatment of solid wood components and fumigation of packing material with methyl bromide. The official heat treatment program recognized by the USDA Animal Plant Health Inspection Service and the IPPC calls for solid wood components (hardwood and softwood) of packing material to be brought to a core temperature of 56° C or approximately 133° F for a minimum of 30 minutes. The product must be stamped or marked by a registered agency. A specific fumigation program has been developed by the National Wood Pallet Container Association. The NWPCA is responsible for giving certification to other agencies to then certify companies. Q9:Who will be affected by these measures? These regulations will not only affect pallet, box and crate manufacturers/users, but it will also change the process for anyone using solid wood skids and sticks for overseas lumber shipments. Q10:Can we still use untreated materials on shipments between NAFTA countries? NAFTA will allow transportation of goods between Canada and the United States without the certification marks. However, NAFTA provisions do not apply to Mexico because of forest pests identified in Mexico. Q11:When do heat treatment requirements for hardwood take effect? On March 15, 2002, the IPPC adopted international regulations governing softwood and hardwood packing material. It is the responsibility of individual countries to adopt the standards. Most countries planned to have their rules in place by the summer of 2004. Q12:How is a quality mark acquired? What is required to maintain it? To receive the use of a quality mark, an audit program must be completed. An individual may enter as a heat treater (if he/she has the capacity to heat core temperatures to 56° C or approximately 133° F for 30 minutes) or as an HT producer (purchasing HT lumber to produce an HT pallet, box, etc.). The audits are monthly and require records that document heat treatment or purchase of HT lumber, sales and inventory. Auditors go onsite to inspect records, lumber and products. Q13:What is being done to review and approve other treatment methods such as irradiation? USDA-APHIS is not involved in development of new treatment methods. The IPPC will review the standards every three years, so such treatments can be examined at that time. Q14:Can material that has been heat treated and stamped be stored outdoors? There are not specific standards on storage of heat treated materials. Many audit programs are requesting that heat treated components and pallets be stored in an area separate from nonheat treated components and pallets for safety purposes. Q15:Do the standards apply to all species? Q16:Do pallets have to be bark free? Not generally. At one time, there were requirements specifying debarked lumber (not necessarily bark free) within WPM at one time. However, there was no scientific reason for this specific wording in an earlier standards draft because heat treatment should destroy any bugs within the lumber or bark. However, the requirements have an optional condition for debarked lumber by individual nations. European Union countries have been supporting the debarking issues at the IPPC meeting. But at this point it is unclear if these countries will adopt different standards. Q17:If I comply fully with the IPPC standard as it reads now, will the countries that currently have regulations in place accept those shipments? Each individual country must adopt regulations that are consistent with the IPPC standard. If a country already has its own standard, the current standard remains in effect until the country readopts the new standard. Q18:Can there be a travel around treater? No, there must be a resident quality mark for each facility where the treatment has taken place. Q19:How is the treatment of loose dunnage being completed? There is no real guidance on loose dunnage. But the ALSC says to mark the board with the grad stamp, because it will eliminate any doubt in other ports around the country. Q20:Can branders be used on machinery to brand the pallets as they are being made instead of after they are heat treated? The American Lumber Standards Committee indicates that this is not an acceptable practice. The quality mark must be placed on the material after it is treated. Q21:Can a rolling mark be used on the side of pallets? Yes, a rolling mark may be used after the treatment process. Q22:I have been receiving softwood and hardwood that have just been stamped “HT”, but not the grade stamp that includes the agency logo and plant number. Can this HT lumber be used to construct the pallets for a stamp (or quality mark)? No, the heat treated lumber must have the grade stamp that is audited by an agency prior to placing the quality mark. Q23:What about wood materials that are already enroute? Will there be a “grace period”? The standard doesn’t address this, but our expectation is that there would be a short, lenient implementation period for each country. Q24:Will lumber shipments being shipped as a commodity be affected? The IPPC standards only apply to nonmanufactured wood packaging material used in transporting commodities. Q25:How long does heat treatment last? Once components or pallets have gone through the heat treatment process, they are “heat treated” until removed from use. Q26:What is a typical kiln schedule for heat treating hardwood? Most hardwood will likely be heat treated as the assembled pallets; it may prove too difficult to saw and nail HT boards that have lost much of their moisture. There are a few ways to prove that core temperature reaches 133° F. One includes direct measurements of core temperature by placing probes into drilled holes. The other requires the use of live steam with a maximum wet bulb, dry bulb depression of three percent. Schedules have been developed based on specific gravity, lumber dimension and chamber temperatures. Q27:Can treated material be reused? 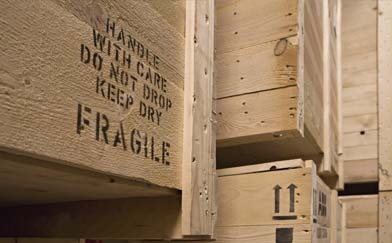 A shipper may reuse the wooden pallet indefinitely once it is stamped as long as there are NO changes. There can be absolutely nothing done to the wooden pallet  it cannot be taken apart/reassembled, a tiny piece cannot be cut off, etc. If anything is changed with the pallet, no matter how small or significant, then it must be retreated and restamped. Q28:How do we handle recycled pallets? Recycled pallets must be completely retreated. If packaging materials are repaired, the entire unit must be retreated and marked. Fumigation is the process of placing wood packaging material in a confined area and using a chemical to treat the material that kills bugs, microscopic organisms and rodents. The only approved chemical that can be used in the United States is methyl bromide. The United States EPA is in the process of phasing out the use of methyl bromide. However, there is a special exemption for the use of methyl bromide for quarantine and preshipment applications. This exemption was finalized on January 2, 2003. Q30:Will there be requirements for fumigation? The National Wood Pallet and Container Association (NWPCA) is the national agency for fumigation standards. NWPCA approves agencies to certify companies on the fumigation standards. Q31:Can fumigation be used under the new international standards? Yes, fumigation may be used to meet the international standards.